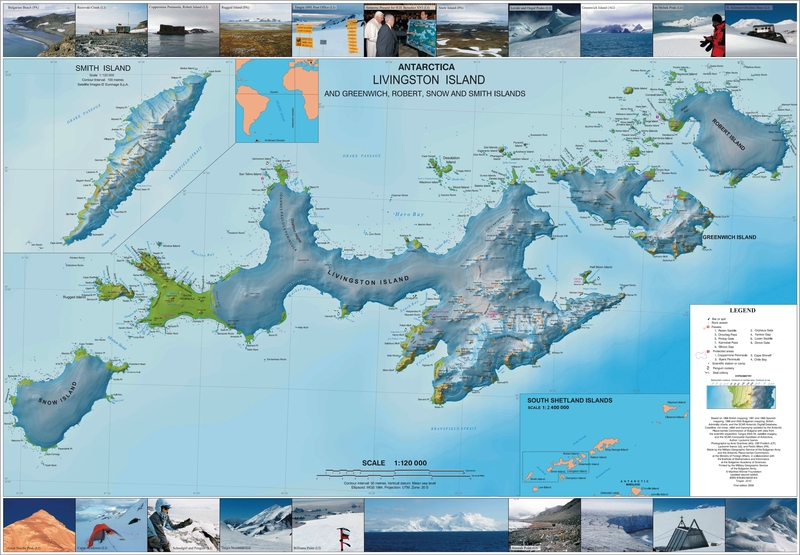 Location of Livingston Island in the South Shetland Islands. Dañobeitia Crag (Bulgarian: хълм Даньобеития, ‘Halm Dañobeitia’ \'h&lm da-nyo-be-i-'ti-ya\) is the sharp rocky hill rising to 205 m on the north coast of Livingston Island in the South Shetland Islands, Antarctica. It is surmounting Siddins Point, formed by an offshoot of the hill, Hero Bay to the north and its parts Vasilev Bay to the east and Maleshevo Cove to the southwest. The feature is named after Juan José Dañobeitia Canales, manager of the Spanish Antarctic programme, for his support for the Bulgarian Antarctic campaigns. Dañobeitia Crag is located at 62°32′57.6″S 60°25′48″W﻿ / ﻿62.549333°S 60.43000°W﻿ / -62.549333; -60.43000Coordinates: 62°32′57.6″S 60°25′48″W﻿ / ﻿62.549333°S 60.43000°W﻿ / -62.549333; -60.43000, which is 1.8 km northwest of the summit of Teres Ridge. British mapping in 1968, Spanish in 1991, and Bulgarian in 2005 and 2009. Dañobeitia Crag. 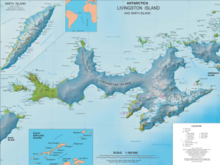 SCAR Composite Antarctic Gazetteer. This page was last edited on 16 January 2019, at 07:39 (UTC).